This link will take you to a short video on YouTube, filmed in April 2009. This huge fish is often seen by divers, sometimes hovering just within sight, and other times seemingly as curious about the divers as they are about him. He was nicknamed "Kombi" many years ago because of his size. Hold your cursor over an object on the reef grid map below to see a photo and to find out more information on the object. The Porteur 77 was 130ft gravel barge that had a fully loaded displacement of around 770 Tonnes. The barge was provided to the association by Metallia Sand & Gravel Co. 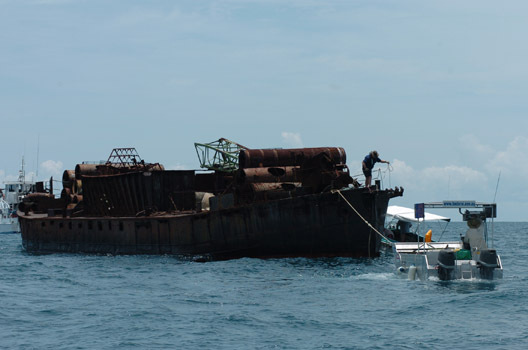 It is one of the largest features of the Cochrane Artificial Reef. Click the photo on the left to jump to the Porteur deployment gallery. These steel modules were part of the August 2006 DAFF Deployment. 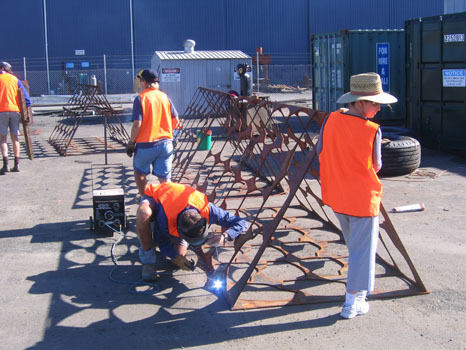 The photograph shows BADARAI members building the modules prior to deployment.